CAPE CANAVERAL, Florida -- On Thursday, October 23, 2014, a partial solar eclipse will be viewable to nearly everyone in the U.S. and Canada (with the exception of New England and Hawaii) just before sunset. 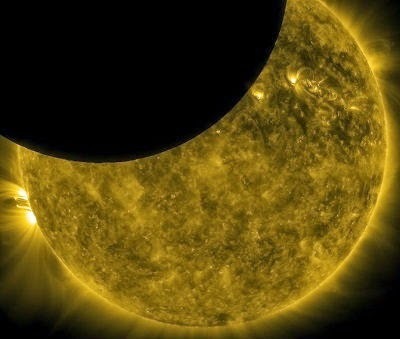 A partial solar eclipse is when the Moon passes in front of the Sun with a fraction of the Sun still remaining uncovered. The portion of the Sun that the Moon will cover varies depending on the viewer's location. According to NASA, coverage in the U.S. will range from 12% in Florida to nearly 70% in Alaska. The greatest eclipse will be seen from Canada's Nunavut Territory near Prince of Wales Island where the eclipse in the horizon will have a magnitude of 0.811 (81% coverage). Warning: Don't stare. Even at maximum eclipse, a sliver of sun peeking out from behind the Moon can still cause pain and eye damage. Direct viewing should only be attempted with the aid of a safe solar filter. Cape Canaveral, FL 6:16 p.m.
Des Moines, IA 4:30 p.m.
Kansas City, MO 4:35 p.m.
Little Rock, AR 4:49 p.m.
Los Angeles, CA 2:08 p.m.
New Orleans, LA 5:05 p.m.
New York, NY 5:49 p.m.
Oklahoma City, OK 4:40 p.m.
Salt Lake City, UT 3:05 p.m.
San Antonio, TX 4:56 p.m.
San Diego, CA 2:14 p.m.
San Jose, CA 1:54 p.m.
Santa Fe, NM 3:27 p.m.
St. Louis, MO 4:41 p.m.
Eclipse times derived from: “Eclipses During 2014,” F. Espenak, Observers Handbook: 2014, Royal Astronomical Society of Canada.